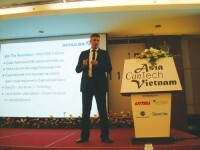 More than 350 people made the trip to Ho Chi Minh City in Vietnam for the 2011 Asia CanTech conference. Attendees were treated to a variety of presentations from the state of the economy to layer pads for the canning industry. 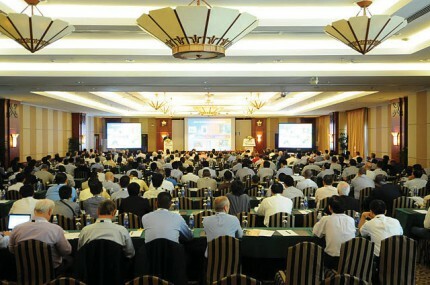 Asia CanTech 2011 took place at the Rex Hotel from 17-19 October. This year’s Technical Forum team had a slightly different look to it and was well received by attendees. The Forum was presented as a review of can making fundamentals and covered all aspects of the process. Look out for in-depth content from the Technical Forum in future issues of CanTech International. A total of 26 presentations took place over two days while the Tabletop Exhibition once again gave suppliers the opportunity to showcase their products and services. Keynote speaker Gihan Atapattu, president of Ball Asia Pacific, opened proceedings with a presentation titled ‘Growing together in a difficult economy’. Atapattu, who has worked for a number of companies including the SML Group and Avery Dennison, talked about the opportunities for growth in Asia. “We have a unique opportunity to come together here to look at the industry and at the opportunities sitting in front of us in Asia,” he stated. During his presentation, Atapattu looked back at the economy over the last 10 years and told attendees that they needed to “anticipate what would happen over the next decade”. He also pointed out that China has passed the US as the world’s largest economy. He also talked specifically about expected growth in the beer sector and revealed that the US was expected to grow between 12 and 15 million hectolitres. Despite the optimistic tone of Atapattu’s presentation he also sounded a note of caution. “The can is a great product but if it becomes too expensive the growth will not materialise. We’re not selling to each other and have to hope that someone on the street goes into a shop and picks up a can. For them to do that and enjoy the benefits of a beverage can they have to be able to afford it. If you look at the per capita purchasing power of China it is ranked with Angola. How many can lines are we putting in Angola? Not a lot because the purchasing power is so low. The reason we talk about Asia is because of the volume of people. 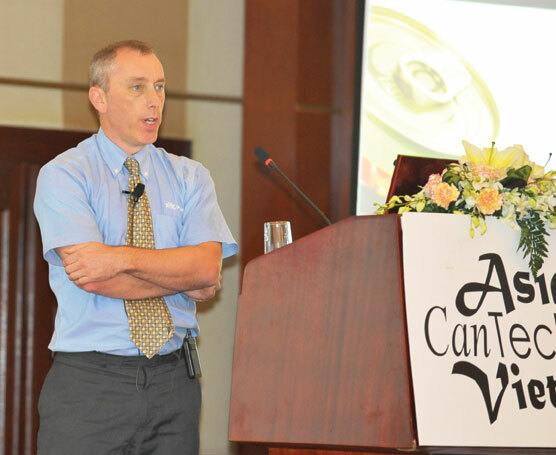 Second keynote speaker Mark Davies, business interface manager Asia Pacific for Crown Packaging, focused on ‘Innovation drivers in metal packaging’. Crown is a producer of 100 billion cans and ends worldwide. It is the third largest producer of beverage cans in the world. Earlier this year Crown announced plans to expand beverage can production capacity in all three of its existing facilities in Vietnam. The plants are located in Hanoi, Saigon and Dong Nai. Davies said that Crown’s total capacity in Asia would rise from 10 billion to 14 billion by 2013. He explained how Crown has the world’s largest dedicated packaging research and development facilities in Wantage, UK and in Alsip and Lancaster in the US. “Innovation is 99 per cent perspiration and about one per cent inspiration,” explained Davies, before describing what drives innovation in packaging. Sustainability is a particularly important issue for Crown. “This is probably the most demanding area that we have to tackle at the moment,” Davies pointed out. “Metal has a very good story to tell. It is 100 per cent recycylable and in many places in Europe we achieve up to a 90 per cent collection rate. In the US it is typically 60 per cent and is increasing rapidly in Asia. “Sustainability offers a good route for the consumer to feel good about themselves, in terms of being able to contribute to environmental activity. Bud Patel, vice president of sales at Applied Vision, discussed the evolution of machine vision. The US company produces machine vision systems for the food and beverage industry. Patel talked about the changes in the marketplace since the company introduced its first system in 1971. Most recently the company unveiled its new Cyclops inspection system at Metpack in May. Cyclops combines imaging, lighting and processing into one compact enclosure, eliminating the need to run multiple cameras on a single processor. Cyclops can be placed almost anywhere on a line, alerting operators of potential defects as early as possible in the manufacturing process. Patrick Geffers, sales manager graphics, from Stork Prints gave a presentation entitled ‘Winning in a competitive market – A different view on the two-piece can industry’. Stork Prints is a leader in direct laser engraving – a process that is a purely digital means of printing form imaging that eliminates costly products like film and time consuming processes such as exposure, washing and drying. Geffers talked about how this process can help produce much better looking cans. During his presentation Geffers showed examples of different types of packaging and stressed the importance of a good looking product. Marcus Greenbrook, international sales manager for GEW, spoke about UV curing and its developments and benefits. GEW is a specialist manufacturer of UV curing systems for a range of printing and coating applications. Greenbrook talked about how the company supplies energy efficient technology. He explained how GEW had reduced its customers’ energy bills by an estimated €7 million, saving 29,000 tonnes of CO2. One of the ways this is done is through using GEW’s E-brick electronic power supplies, which are more efficient than their transformer based equivalents, explained Greenbrook. Michael Marschall, sales director packaging for Schuler Pressen, discussed the company’s new vertical bodymaker in a presentation entitled ‘Join the revolution – the ICON V-Drive’. Marschall explained that the ICON V-Drive is a vertical machine for the forming of can bodies (bodymaker) which boasts compact dimensions, extremely low material consumption and the possibility to process recycled materials. It can be used for the production of aerosols and bottle cans. James Finn, vice president global parts and service for Stolle Machinery, gave a presentation entitled ‘One Stolle, the challenges of corporate transformation’. Shortly before this year’s Asia CanTech it was announced that Japanese can maker Toyo Seikan Kaisha is set to buy Stolle Machinery Company for approximately US$775 million (59.7 billion yen). 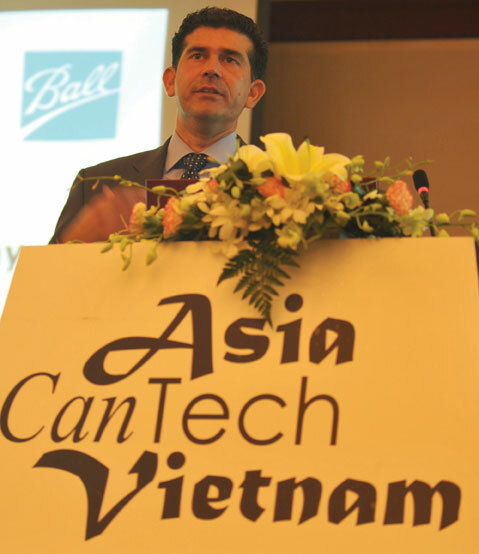 Finn revealed that the company is planning to build a new manufacturing facility in Vietnam next year. Final keynote speaker Robert Zanetto, business development director Metal-Asia for Ardagh Group, spoke about the company and the importance of sustainability. Zanetto revealed that Ardagh (formerly Impress) has invested €440 million in research and development over the last five years. He told attendees that the global market for metal packaging will grow to US$165.4 billion by 2021. According to Zanetto, this expansion will be driven by wealth increasing in emerging markets. In Asia Pacific, Zanetto displayed statistics that showed how food packaging is made up of approximately 640 billion units, and of that only 12.9 billion units are metal. “There is room for improvement and that’s why we are here,” he observed. Talking specifically about the Vietnamese market, he said there had been a six per cent increase in the metal packaging market between 2010 and 2011. Zanetto was keen to stress the importance of sustainability and the infinite recyclability of metal. “Metal will only be lost on this earth if we send it on a rocket to the moon,” he says. He described how metal packaging can help prevent food waste and in turn help those living in hunger. Johan Jonkman, international sales manager at VMI, gave a presentation entitled ‘VMI process systems: A clean and green future’. He talked about the recent expansion of the company’s plant and offices in Yantai, China. An assembly hall with a footprint of 7,200m2 was completed in August and increases the size of the VMI Yantai facilities to almost 30,000m2. The can making equipment supplier specialises in can washers and dry-off ovens. Jonkman paid particular attention to the company’s latest generation dry-off oven. Gao Bing from Henkel talked about the company’s presence in Asia and around the world. Henkel is a leading supplier of can making lubricants and cleaners to the two-piece can industry. Bing highlighted Henkel’s product line and stated that the company is a full front-end provider from post lube, cup lube, coolant to washer. Mark Novotny from Nordson gave a presentation entitled ‘New developments in controlling the inside spray process for cans’. Nordson is a leader in providing complete system solutions for applying and curing adhesives, sealants, lubricants and coatings to two and three-piece cans. The issue of Bisphenol A (BPA) is never far from the surface these days and was tackled by Michael Ruben from Schekolin in his presentation ‘Challenge BPA (free) powder for metal packaging’. Schekolin is a provider of solvent based and powder coatings for metal packaging. Ruben talked about the advantages and disadvantages of powder coatings and warned that the metal packaging industry needed to start thinking about alternatives to BPA. 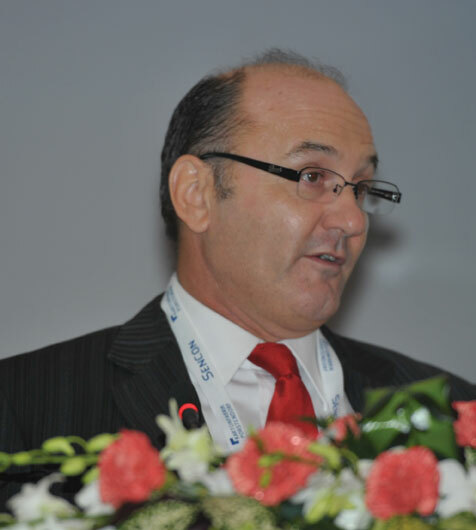 Tim Yeates from Sencon gave a presentation entitled ‘Inspection and measurement systems – A look into the future’. Sencon manufactures sensors, line controls, test and inspection equipment, and quality assurance gauges for the metal packaging industry. The overriding feeling to be taken away from Asia CanTech 2011 is that the region is booming. Vietnam itself is an emerging market and on the evidence of this year’s conference it is not being ignored.